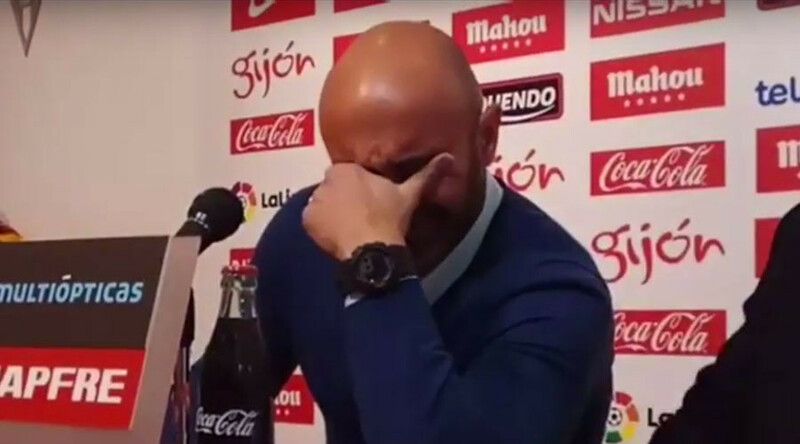 Spanish football coach Abelardo Fernández rejected a €4 million (US$4.2 million) compensation payout after quitting his role at struggling La Liga team Sporting Gijon. The 46-year-old resigned as head coach earlier this week, with the team 18th in the division, having lost seven of their last eight games. Gijon native Abelardo spent five years at the club as a player, and took over as coach in 2014. “I cry for these people, for this club and for the fans, who I love so much,” he said at a news conference on Wednesday, as reported by Spain’s AS newspaper. “As a Sporting fan, even though I had a contract until 2020, I couldn’t do that to the club I love. I did the same at other clubs and it wasn’t going to be any different here. I don’t have a problem writing off the money. There are more important things, loyalty to my club above all,” Abelardo said, referring to the decision to write-off the compensation. The gesture, which may surprise some given the frivolous climate of modern football, was met with broad approval on social media. Abelardo leaves Sporting Gijón after 10 losses in last 11, but stays a club legend. Gijon have now appointed Joan Francesc Ferrer, also known as "Rubi," as their new head coach, according to reports.